Yesterday was the opening night of Fan Expo Vancouver, and I used a combination of stealth, charm, and an ancient technique known as “paying for a ticket” to gain entry. 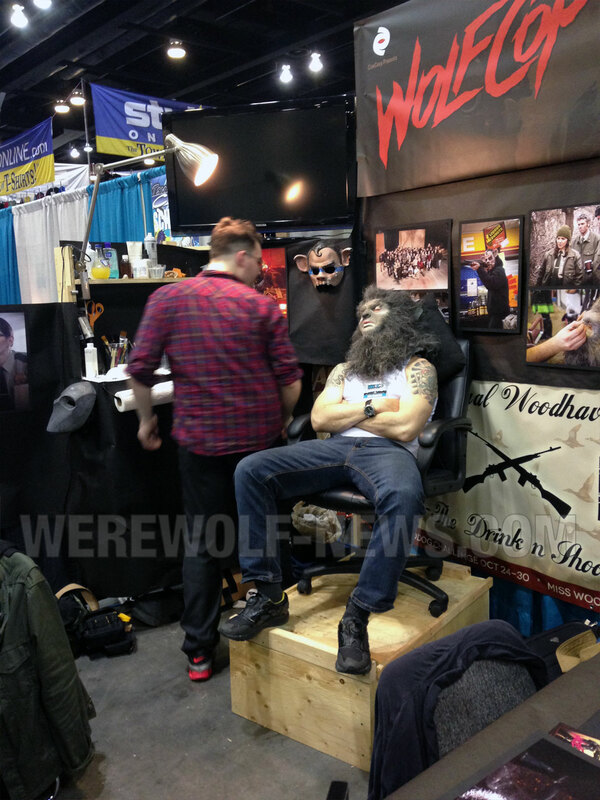 Once inside I spent most of the evening lurking around booth 143, where the WolfCop crew was set up. 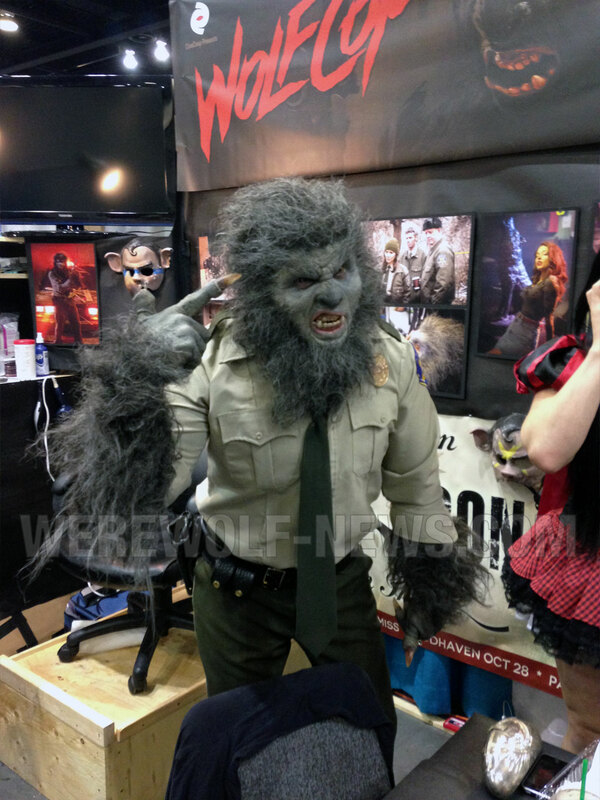 Over the course of three hours Emersen Ziffle transformed Leo Fafard into the lycanthropic lawman, while CineCoup and production representatives (hi Megan!) explained the film to an increasingly enthralled crowd of passersby. 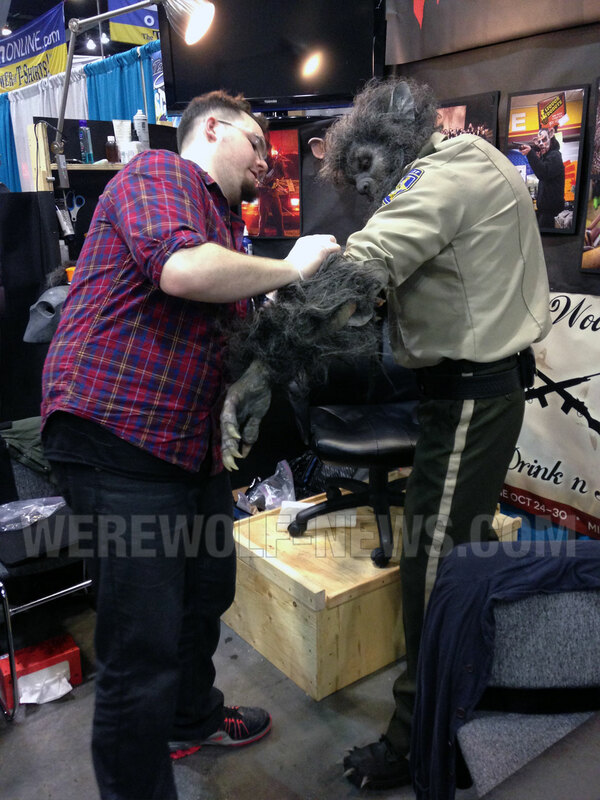 Director Lowell Dean was there too, answering questions and helping Emersen get Leo’s uniform sleeves rolled down over WolfCop’s enormous clawed gloves. The June 6th release date is for Canadian Cineplex theatres only, but an announcement regarding wider distribution – presumably covering US and international markets – should be happening in the next week or two. The film will have a two-week engagement in Canadian theatres, but it could run longer if audience numbers are good. Lowell Dean graciously endured my initial fanboy freakout and we had a great conversation about the film’s promotion, the bright side of having to shoot outdoor scenes in sub-zero Saskatchewan winter weather (atmospheric snow effects), and the action figures available through the Indiegogo campaign. He had the affable, easygoing air of someone who gets to do what he loves with people he trusts. Leo Fafard is enthusiastic, charming and intense, even when faced with the prospect of having to sit still for three hours while someone glues stuff to his face – again. I look forward to seeing how he channels that energy into his portrayal of Lou in the film. Emersen Ziffle tackled his work with fastidious care, and surveyed the prowling, capering results from a distance with the quiet satisfaction of a proud parent. 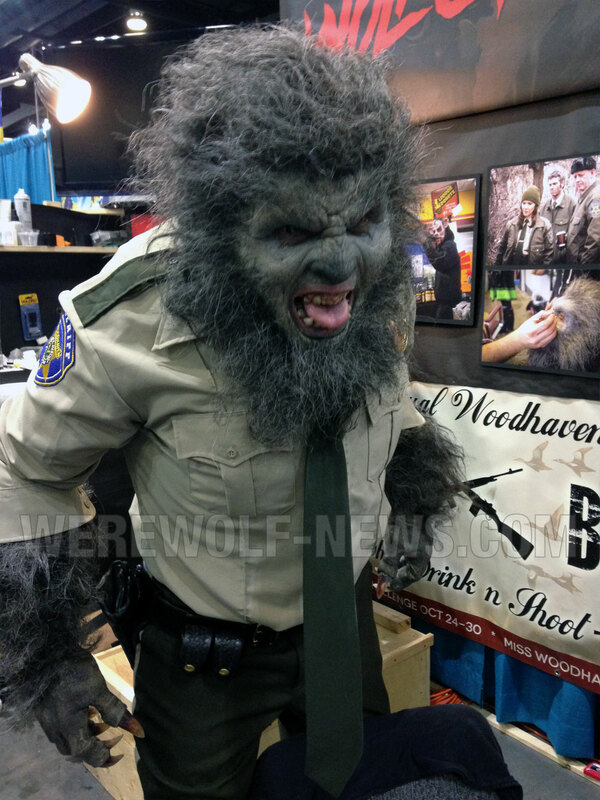 After chatting with him I learned that this was roughly the 25th time he’d applied the makeup to Leo, and it was clear to me that he didn’t think the casual convention setting was an excuse to compromise on quality. 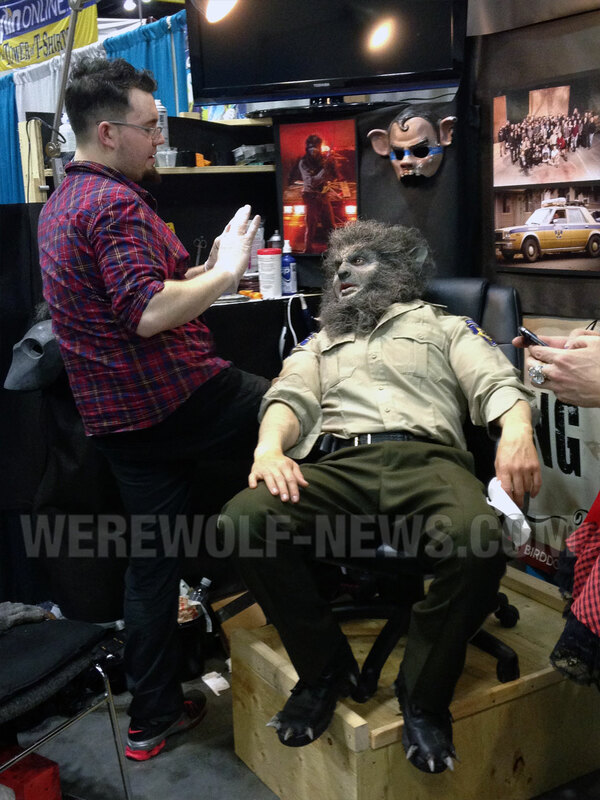 The main makeup application appeared to be a two-piece prosthetic, comprised of a cowl that surrounded Leo’s face with fur and built-in pointed ears, and a facial prosthetic that blended into the larger piece at the edges. 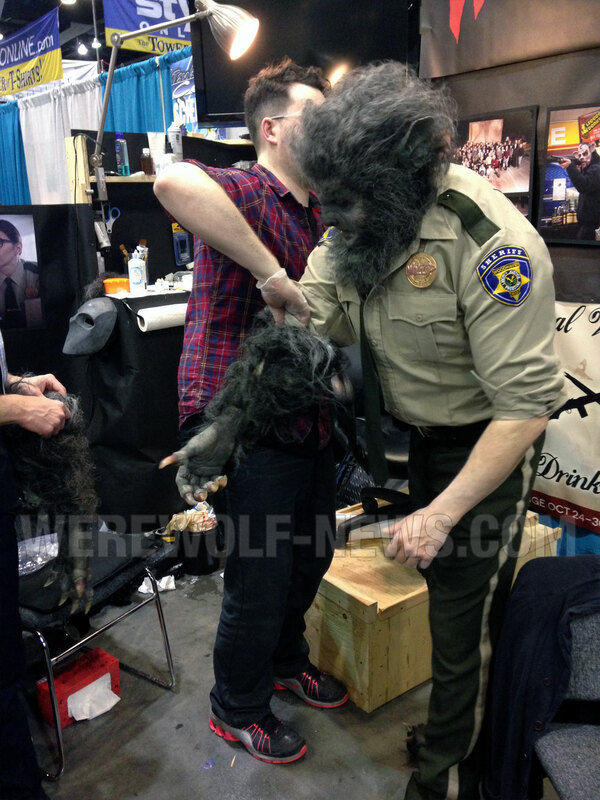 Leo inserted his own contact lenses and dental appliances, and Emersen and Lowell helped get his werewolf gloves on like a Formula 1 pit crew changing tires. The nails on the gloves were solid and fairly sharp, and even at close range the detail on everything held up wonderfully. I heard more than a few folks exclaim with glee over the film’s tagline “Here Comes The Fuzz”, which replaced the “Dirty Harry… Only Harrier” line initially seen on the official poster. 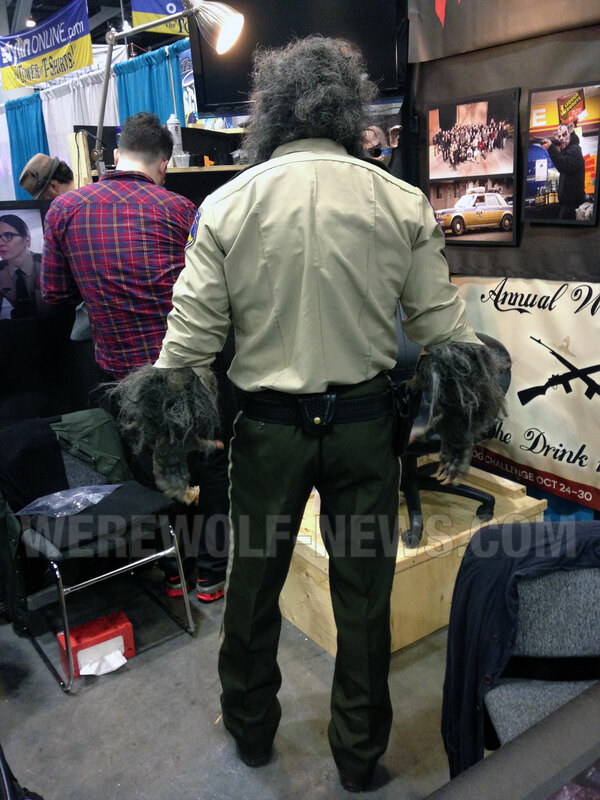 I got deputized with an official WolfCop police badge, so, you know, don’t be doing any crimes near me. 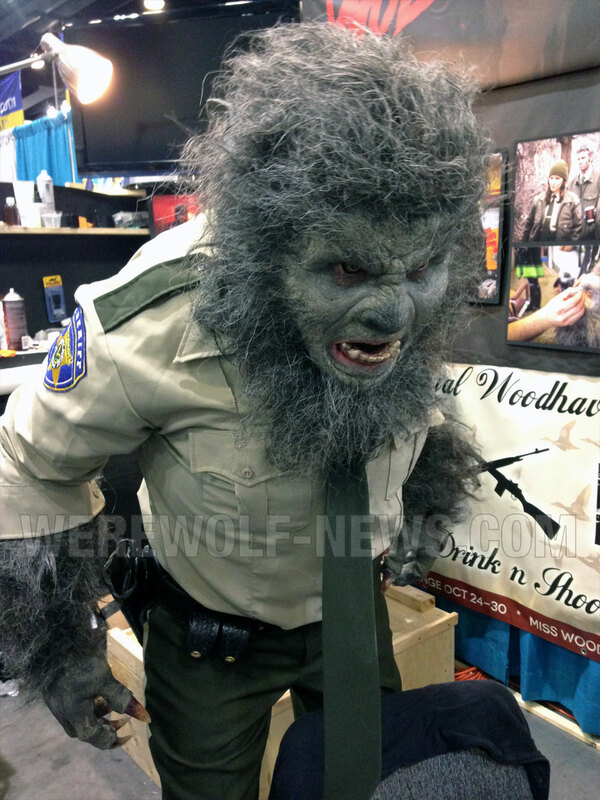 The WolfCop presence at Fan Expo Vancouver continued today, with a panel at 11AM, followed by another makeup transformation. If you’re in the Vancouver area, you still have a chance to see Lowell, Leo, Emersen and friends tomorrow. 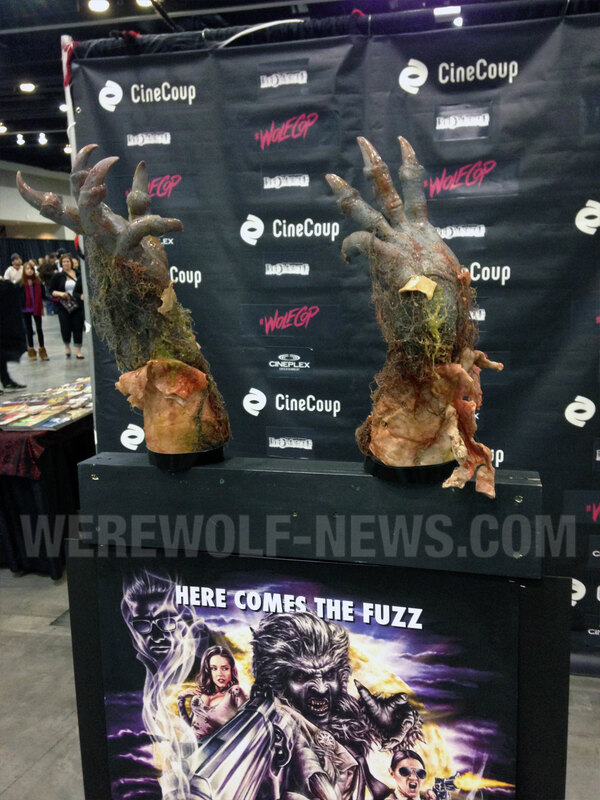 After that they’ll also be at the Calgary Comic & Entertainment Expo April 24 – 27, and at Fan Expo Regina May 3 – 4. I imagine further events will be announced as the premiere approaches. 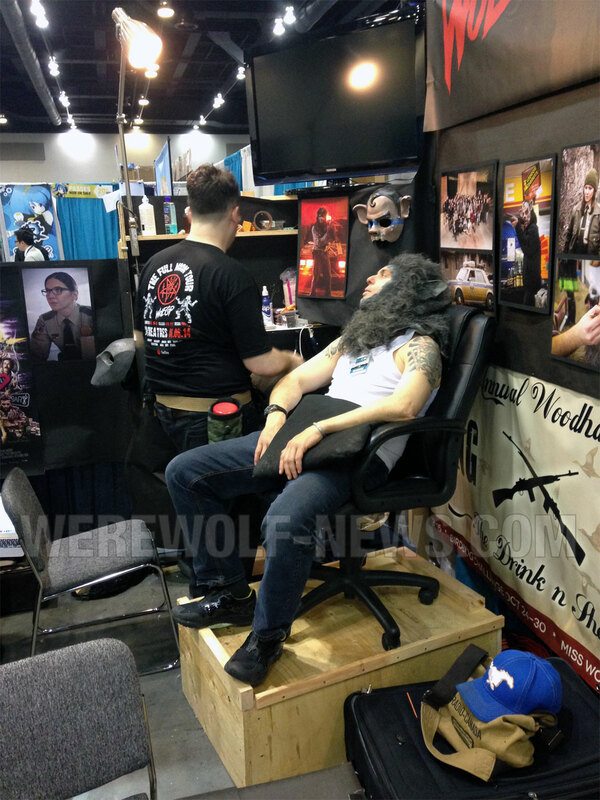 Below are some photos I took of the makeup process. 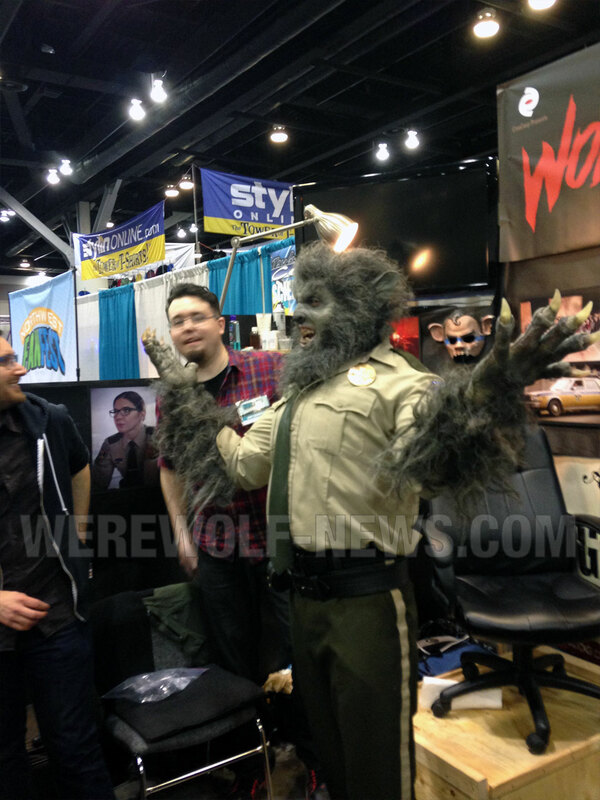 Many thanks to the WolfCop crew for letting me hang out!